There is absolutely no comparison to make with other franchise systems in this area. From top management on down, there is a willing ear. If there is an idea that will help the business grow and evolve, my experience has been that they are ready to hear and implement it. Fellow franchisees? I have never seen a more supportive group. Every time I have asked for help, it has been there. A good number of the Southern California franchisees are getting together now on a frequent basis. In all my due diligence within the sign business category, FASTSIGNS International came up on top in every area. I feel that FASTSIGNS goal is to make the franchisee's as successful as possible. - David Becker, Arlington Heights, IL - FASTSIGNS owner since 2004. Many franchisors derive profit by providing financing, leasing and selling inventory supplies. At FASTSIGNS®, we depend primarily on the royalties from our centers for our corporate revenue stream. As you grow sales and profitability, we succeed. At FASTSIGNS® we believe the most important factor in our success is the fact that we are absolutely committed to giving our franchisees every possible competitive advantage. 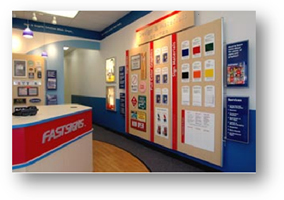 Owning a FASTSIGNS® franchise is extremely rewarding, exciting, and dynamic! Approximately $260,000 turnkey investment ($35,000 working capital). Minimum financial requirements: $250,000 net worth, $75,000 liquidity. At FASTSIGNS®, our primary goal is to help our franchisees build their business. And were accomplishing our goal! **Average gross sales for the period ending 12/31/07 as stated in our Franchise Disclosure Document. As a FASTSIGNS® franchisee, you will have the benefit of one of the most respected brand names in the sign business and in franchising as a whole. Additionally, you will have the support of the industry's most thoroughly researched and proven systems for operations, marketing, finance and overall business management. Join a recognized leader in the sign and graphics industry. FASTSIGNS® centers use state-of-the-art computer technology to create custom signs, graphics, banners, trade show exhibits, vehicle graphics and much more. A pioneer in the sign industry, FASTSIGNS® has continued to grow by optimizing our systems and expanding the scope of our products and services. 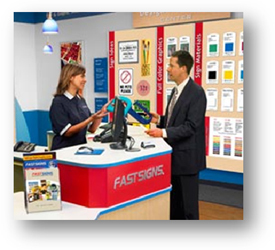 Today, with a growing store network of over 550 centers spanning the globe, FASTSIGNS® is an acknowledged leader in one of the world's most dynamic franchised industries. * Per Our Franchise Disclosure Document ** These figures are only estimates, there is no assurance you will do as well. If you rely upon our figures, you must accept the risk of not doing as well. Average gross sales are based on gross sales reported by 422 Centers open in the United States for the entire year ended December 31, 2007. Of these 422 Centers, 171 Centers or 41% achieved the gross sales average. Offering by prospectus only. © 2007 FASTSIGNS International, Inc.
Click on Request Information for FREE info on how to open a FASTSIGNS franchise today! Please Note: This FASTSIGNS franchise opportunity and other franchise business opportunities, businesses and franchises for sale on this web site are not to be considered as an "offering", "franchise offering", suggestion or recommendation by Franchise Leader™. This advertisement depends entirely on the truthfulness of the information provided by our advertisers which includes, but is not limited to, franchisers, franchise brokers, franchise consultants and business brokers. Franchise Leader™ recommends that you consult a lawyer, financial consultant, accountant or professional advisor before buying a franchise or business opportunity or any type of business. By using this form or any part of our website, you have agreed to all terms and conditions of Franchise Leader™. Please review our Terms & Conditions for more information.